Percy Arnold LLOYD-JONES M.B., B.Ch. Percy was educated at Manchester Grammar School; at St John�s College, Cambridge; and at St Bartholomew's Hospital, London - entering as a student in 1899. 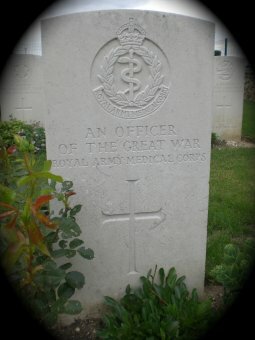 Before entering the hospital he served in the ranks with the Suffolk Regiment, and was present during the Boer War (1900-1901) - gaining the Queen's South African Medal (3 clasps). He obtained the diplomas M.R.C.S., L.R.C.P. in 1904 and graduated M.B., B.Ch. in 1907. He served as a house-surgeon at the Bedford County Hospital before obtaining a commission in the R.A.M.C. at the rank of lieutenant on 30th July 1904. From 10th February 1906 to December 1910 Percy served in Malta. During this time he gained promotion to Captain on 30th January 1908, and served with distinction in the rescue operations after the Messina earthquake on 28th December 1908 - receiving the Order of the Crown of Italy for his rescue work there on 28th July 1911. From 26th November 1912 to January 1913, he served in the Balkans Campaign with a British Red Cross Society unit - receiving the British Red Cross Medal. In 1913, he became a Specialist in Ophthalmology. Percy was mobilized as soon as war broke out. He joined the 4th Field Ambulance, in the field, on 22nd September 1914, then took over command of the unit at Soupir on the 7th October. On the 6th November he gained a temporary promotion to Major, and served under that rank until he received a full promotion to Major, along with a temporary promotion to Lieutenant Colonel on 1st July 1915. Shortly after the unit was transferred to the Guards Division and Percy took up a staff appointment as Deputy Assistant Director of Medical Services [D.A.D.M.S.] for that Division. Percy was wounded at Fouqueviller and died from his wounds the same day. He was the son of Dr and Mrs Lloyd-Jones of Abbotshill, Great Malvern, Worcs.